The body demands rest after the kind of ordeal we went through the previous day. The camp woke up late in the morning. The clouded skies and the chill in the air did nothing to help the situation. It was as if we were planning to spend the day there! In the hurried team-council I called for, the general mood was more that of a rest-day.
" That rest day is today. And if we do not reach the targeted camp on this day, we shall be minus one day!" I quickly added. Rataban Glacier had already claimed one of our slack days and it was likely to consume the other slack day even if we managed to reach Bank-kund lake that evening. Unless we reached Bank-kund camp there was little hope for crossing Gupt-Khal on schedule. We should then be charting course for Ghamsali- our emergency mid-point exit. The team was in no mood to give up. "Nahin nahin!! Age chalenge abhi" Vishwa said. Arun, Bharat, Rajesh and Ravin also seemed to be nodding their agreement. Quick orders were passed for lifting camp and we started off around 10. A bit late perhaps, but considering the relatively easy terrain that was expected ahead we hoped to pitch camp in three hours time, at the most. What we hadn't bargained for in that estimation was, the weather that was to unleash its fury and the elusiveness of our target campsite, the Bank-kund lake! Leaving Vinod behind to pack up the camp we started off on the left bank of Rataban Glacier. After about two kilometers of easy walk we reached what we called as Bank-kund Junction. It was a vast amphitheatre of a glacier field where several glaciers met. Coming from the west the Bank-kund glacier described a gigantic curve and led on to our east towards Ghamsali. Two other glaciers were joining in at that point. One was from which we came- The Rataban and another to our west, slightly to the left- the glacier from the Nilgiri Parvat. Right ahead in front of us to the North was the wall of the Mt. Kagbhushand. The somber brownness of the glacier pervaded everywhere made bleaker by the heavy clouds overhead. Here and there one could see a dark-green puddle of a glacial pool. The view towards our planned route, to the left was forbidding. The absolute stillness in the air, the deafening silence, the clouds and the snow lightly covering the craggy rock faces, the Bidhan icefall at a distance with its jagged cascade of the frozen mass and then the sudden start of a snowfall! It was as if the Bank-Kund glacier was issuing its first warning – 'tread with care!'. On the way down to the junction we saw a campsite, probably used by the shepherds. On the moraine ridge there, there were the telltale marks of an open rock shelter and the few pieces of half-burnt firewood. The place can provide a good halt for teams aiming for Bhyunder Khal from Ghamsali side. By mid-noon we had reached the Junction and re-grouped upon a large heap of boulders on the floor of the Bank-Kund glacier. The snowfall had halted giving us a breather to think beyond saving our skins from the snow. But a new challenge had cropped up. We were not able to locate our camp site- the Bank-Kund Lake!! 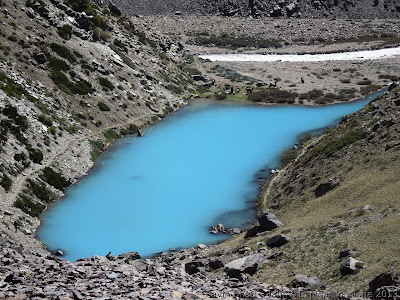 The multitude of glacial pools that we could see all around us was nowhere close to the picture of the beautiful lake I had seen in Mr Kapadia's book. "Inhin pools me se koi hoga Bank-Kund lake dada!" – someone said. "Nahin yaar, Mr Kapadia writes about green grass and birds chirping and all that. None of these look like that" I said. "Birds aur grass to door door tak nahin milenge dada"- came the reply with a chuckle. I think it was Bharat. "It must be on top of that moraine ridge- its supposed to be beyond the icefall from Nilgiri and on the right bank of the Glacier"- I said, looking into my GPS display- the tracking needle was pointing straight at the corner of the ridge.
" Chalo, woh bhi dekh lete hain wahan chal ke" – Suraj added as he proceeded forth with Vinod towards the distant moraine ridge. My worry was the team morale. If we could reach our planned camp, not only would it be a good place to spend the night, but also would bring us back on schedule. If the new morning brought in some good weather, we would be reasonably confident and motivated to aim for Gupt-Khal. Even while I was ruminating the various possibilities, walking in the general direction where Vinod and Suraj had gone, the radio crackled alive. The team zinged back to activity! I was the next to follow, climbing up the steep rocky route to the top of the moraine ridge and then the long beeline of the rest of the team. "… aur jab ye lake dikha, khushi ka thikana nahin raha. Kyonki is lake ko aaj decide karna tha ki hum age jayenge Gupt-Khal ke liye ya nahin.." Suraj was narrating his experience excitedly as I looked on towards the colossal expanse of the Bank-Kund junction. In the midst of all that brown we were in this little oasis of green. The dense grass was spongy enough to make us jump on it like little kids. Probably we were excited about the comfortable sleep ahead in the night :-). Soon the team got busy collecting whatever dried-up shrubs there were, for a probable campfire (It's a different thing that we never lit the camp fire after coming under fire from another round of snowfall :-)). Few feet away, the emerald waters of the Bank-Kund Lake shone under the evening sky. The lake seemed to have some history of visits by people from nearby villages- probably Ghamsali. There was a large cairn set up on the ridge, which can be seen from a reasonable distance by a discerning eye. The open rock shelters indicated that it was a regular camp of the shepherds. Few bright garlands of plastic flowers on the bank of the lake suggested some activity relating to religious rituals. True to Mr Kapadia's account, birds were indeed chirping despite the snowfall and the grass was indeed a dark green and spongy like a foam mattress! The lake had a rejuvenating impact on the team morale. Since all slack days had been used up we had a quick conference in the tents about availability of time for individual members in case we were delayed by a couple of days. We had to have a backup plan in case the weather consumed few more days. Thankfully everyone could afford a couple of days delay. This left us with checking on surplus resources in case of any undesirable hold-ups in the high mountains ahead. "Manage to ho jana chahiye sir," said Vinod, but the doubt I saw in his eyes bothered me for sometime. The grassy mattress made us forget all discomfiture of previous nights. We threw all worries to the winds and hoped for a bright morning. The brightness of the dawn presented yet another enchanting view of the beauteous locale. Thin wisps of clouds were emanating from the mountainside and rising aloft, as if on their way out for the day's work. The emerald waters of the Bank-Kund Lake were radiant with the morning sun. A soft melody was wafting through the cold morning air from Negi's phone. It said, "All is well!" a popular number from a recent Amir Khan release. A young porter was humming a Nepalese Tribal song, which struck absolute harmony with the surrounds. The clouds soon vanished and the sun began to shine bright as the morning wore on. A bright sun always showers energy- literally! The entire team was ready to go by 0900 Hrs- a team record! We had to trust our instincts in deciding the route ahead. It appeared entirely unnecessary to get down to the glacier floor and then find the way up through giant heaps of rocks and rubble; especially when there was such an inviting verdant slope up a relatively gentle gradient on the ridge we were standing upon! The route after the camp proceeds along a grassy ridge on a fair degree of incline. Someone pointed out at a lone Bharal carrying out sentry duty for its herd high above to our left upon the rocks of the Nilgiri Parvat. A lone sentinel standing tall hundreds of feet above us. After the first bend to our left the vista changed dramatically revealing a wide valley from whence came the Bank-Kund Glacier. We proceeded along for a few hundred meters and came to a point where the ridge ended abruptly, cut in by a steep snow slope coming from high above. The easy route had ended. To make any progress we had to traverse the exposed snow slope ahead. It began as a small shower of snowy dust. For a moment I thought, it was another freak shower of snow. Then we could see the entire snow slope to our left get another wave of those snow-dusts. Presently small snowballs, the size of peanuts came rolling our way. As they rolled they gathered a fine film of snow over them and as they stopped almost near our feet, they had taken the shape of a Rose!! A white snow Rose!! What wonders of beauty exist here! I stood bewitched, looking at it for few moments. The spectacle was getting entrancing as we started venturing deeper into the white kingdom. The wide bed of the glacier lay ahead like some giant python resting. Couple of Kilometers ahead the glacier bent to our right sharply, just beneath the tall ramparts of the ridge that connects Nilgiri and Mandir massif. On the far bank two more icefalls hung lazily from a snowy plateau. They emanated from the feet of the Bidhan Parvat, which was yet invisible to us, recessed deep and far on the high Devban plateau. Suraj , Bhotiaji and Jaisingh went on the lead again. The snow slope was tricky with unpredictable hardness of the ice to deal with. It was exposed to our right at more than sixty degrees. A fall would mean a near vertical short cut to the glacier floor couple of hundred feet below. I watched our lead trio carefully cutting steps with the ice axes and thumping them hard with their boots. It must have been the angle of the boot landing on unpredictably hard ice that must have caused it. All of a sudden, Suraj began to slip. His arms flailing, he started sliding along the slope, which ended in a precipice about 200 ft away. After that was a sheer drop to the glacier floor. "Self arrest karo- self arrest- axe maro baraf me" Jaisingh screamed. "Axe maro sir! Axe maro! "- Shouted Vinod. Suraj did not panic – his recent training in the Basic Mountaineering Course helped. He hit the axe on the slope copybook style and came to an agonizingly slow halt. Our anxious eyes were already measuring up the distance to the probable vertical fall. Slowly he clambered up back to the trail and crossed over with measured caution. "That was close! Thank god you are safe!" I said as we met on the other side of the slope on a relatively safe patch. Jaisingh and Vinod easily found a way down to the glacier bed and soon we were traversing the width of the Bank-Kund Glacier where huge heaps of boulders took us several hundred feet up and down few times. We thanked our stars that the ridge route had saved us at least four kilometers of such frustrating terrain. It was late afternoon when we reached the top of the left bank. We would now remain on this side of the glacier till we reached the snow flats of Garh camping ground. It was already 1500 Hrs and we had 2 Kms to cover. Thankfully the ridge provided a much easier and faster trail and we made good speed for another hour before it vanished into a rocky slope that cut in from above. We were still 800 Meters away from the planned campsite when we decided to call it a day. Camp was set up right there on the moraine ridge. If the weather was better the next day we could make up for the loss in distance easily. Added to that, we had the exit route to Ghamsali in sight. If the weather did not bode well, we could still exercise our exit option. We were at the gateway to the Kingdom of snows. From here on we should be camping above 5000 Meters for several nights. The weather factor would weigh few notches more entering the inner kingdom of snows in the Himalayas. " "Koflaches and gaiters would have to be unpacked from tomorrow onwards" I thought. It was going to be a critical decision the next morning. If we pressed on, there would be no comebacks and if we exited prematurely we would not be able to forgive ourselves. The Gupt-Khal ridge was now barely 10 Kilometers away. It was probably the altitude that allowed us a relatively early morning. A bright sun greeted us as we peeked outside our tents. It was truly the brightest morning we had since the Bhyunder Icefall camp. The panorama dominated one's senses. The Nilgiri Ridge stood proud and tall across the glacier, its top shining with the first rays of the sun. Down in the southeasterly direction the Kagbhushand stood silhouetted with its shapely profile against the golden sun. The Painter was at his colorful best with the cerulean sky, the dazzling sun, the virgin snow, the distant purple of the lower hills and the craggy rock walls playing up the shadows; perhaps a message for us to push on for the goal. The anxiety about the route navigation got resolved as soon as Jaisingh led us through the rocky slope that had barred our way the previous evening. We emerged on a vast sloping field of snow, which looked to be extending several kilometers ahead. The GPS beeped to indicate that this field was our intended campsite of the previous day. The Google reccee was correct! This was indeed a beautiful campsite probably used by Smythe and Kapadia's teams. The divine spectacle further ahead made us forget the travails of the previous days. We were entering the sanctum sanctorum where the Giants rule. The Bank-Kund icefall was the immediate landmark that arrested our attention. Just above the icefall was a huge snowfield that extended to the northwest. Far away was a ridge defining its boundary; a raised mound of brown rising up to giant snow walls on either side. We were having the first views of Gupt-Khal and Garh camping area. If one trained one's eyes to the northern skies, one could see two distinct pyramids. Those were the giant 7thousanders. The one to the left was the Kamet, the tallest of the mountains in the Zaskar ranges and the other was its tall colleague- The Mana. The lofty wall of the Mandir massif blocked our view to the west, to our left. The Nilgiri with its sprawling arms towered behind us, to the south. It is such moments of overwhelming presence of the Mighty Mountain that humbles and kindles the human spirit at the same time. By 1300 Hrs this scenic walk came to an end under a rocky ridge that blocked the route ahead. It was a nice campsite with flowing water streaming from somewhere up above. The GPS indicated that Garh camping ground was a mere two kilometers away. We decided to break for lunch before attempting to scale the rocky ridge. Even as we were untying the rucksack straps, shreds of clouds began adorning the Nilgiri's crown. After another couple of hours of struggle through a kilometer of frustrating soft-snow we finally reached the ridge-top from where we could see the vast expanse of the Garh snowfield. The Gupt-Khal ridge was almost hidden behind clouds in the far corner to our left. Straight ahead, a patch of snowfield was shining in the rays of the setting sun. The GPS pointed towards that area indicating the campsite. After an endless trudge on a gentle slope, we reached the campground at 1630 Hrs. The altitude was 5430 Meters. It was so high up that we had some extended sunlight in the evening, well past 1900 Hrs. The Gupt-Khal ridge wore fiery clouds to our far west. The lovely play of light and shadow in the setting sun made the atmosphere unreal. Asking about health status at the porters' camp, I was informed that one man was suffering from cough and some were feeling a mild headache. One man had a sprain on his ankle. Suitable medical aid was provided to all and we all went to sleep with a subdued anxiety. We were all eager to see how the weather gods bless us the next day. The clear sky next morning presented a grand panorama all around. The Mana and the Pk6977 towards north were visible behind a veil of mist at the top. The furious clicking of everyone's camera was interrupted with a dull and deep reverberation. By now we were familiar with the unmistakable sound of approaching avalanche. All eyes and lenses turned south towards the source of the sound. A silvery cloud was slowly crawling down the slopes of the Nilgiri leaving a smoky mist in its wake that covered the entire wall. It was by far the largest avalanche we had seen. The avalanche debris traveled well into the opposite bank, past the entire breadth of the glacier, engulfing the trail we had left behind the previous day. "What would have happened, if this would have occurred 24 hours earlier? "- I shuddered for a moment thinking of the grim possibilities. By the time breakfast was done, the sky had changed moods. The cloud cover had thickened surreptitiously, without notice. Just a patch of blue was seen above the depression of the Gupt-Khal ridge. Little did we know, that was the last patch of blue we would see anywhere upon the sky for the next 30 hours! We were aware that the Gupt-Khal ridge was 4 Kms away. Our estimations were, we would reach the ridge in about two hours and probably spend another three hours in crossing it. If everything went all right, we should be camping on the other side of Gupt-Khal around 1500-1600 Hrs, a reasonable challenge for the day. Little snowflakes filled the air as soon as we started the walk on the long medial moraine that led north from the camp. Our idea was to avoid the snowfield as far as possible north and then take a sharp turn to our left towards west, which would then lead us straight to Gupt-Khal. The giant snowfield resembled a frozen ocean surface. Aeons of winds had sculptured the surface into various patterns of waves as one sees on sand dunes in the deserts. Because of the clouds above, the snow held under the feet, unlike the previous evening. The ridge ahead and the mountains behind were appearing blurry in the snowy haze. We were walking in a tight single file with absolute silence as if in reverence to the challenge that was becoming harder with each step. First they appeared like giant mushrooms. Those were rocks, almost the size of a small car that were robustly resting on thick stems of ice about three feet tall. Clearly, the entire snowfield had melted and reduced its level by about three feet since the time the rocks came to rest on these fields. Because of the altitude, the ice under the rocks had not melted and the rocks remained rested at that elevated level. The un-melted ice underneath the rocks now resembled stout pillars. It was as if the rocks had frozen in Smythe's times. Some cataclysmic event would have brought those rocks down from the Mana massif nearby. "Was it like this when Smythe visited here?" I wondered. "May be. May be not. May be he just saw some rocks scattered around? The mushroom effect would have happened in the recent accelerations in ice-melt! Who knows?" We rested for a while under one of those giant mushroom rocks (Professor Suraj corrected me later saying the actual nomenclature is 'Glacial Tables'). The ridge was appearing much closer now. The porters seemed to have lifted camp only a few minutes back. The snowfall was heavier and the day seemed to be dimming all on a sudden. The altitude read 5600 Meters at that point. Worry was written over everyone's face including Jaisingh's, as he was seen imploring Vinod frequently to speedup things and catch up fast. Our team looked like a team of intrepid polar explorers proceeding in the middle of a giant canvas of white hatched with slanting lines of falling snow. One could not tell which was ground and which was air. Everything was completely white! Just the bare outline of the Mana icefall was visible behind- a new landmark that marked the area where Smythe had camped for several days during his maiden and successful attempt at the Mana peak. As soon as the ropes arrived Jaisingh, Vinod and Suraj went ahead to break route and fix rope. The slope appeared doable but would surely require rope support. Half an hour later, even as the snowfall hardened, Jaisingh reported negative news over the radio- "Minimum dedh ghanta aur lagega sir rope fix karne me. Abhi ek baj raha hai. Aaj nahin ho sakta. Porters ko rok lo." So near yet so far! We had to camp and weather out the snowfall. There was no point pushing on. The weather was expected to worsen during the later part of the day. We did not want to be caught on top of the pass or caught in a dangerous descent when the weather was at its worst. It was our highest camp in the trek. Thankfully, everyone in the team seemed to be in fine fettle, no signs of AMS except for few cases of mild-headache. It was the cold and the snow that bothered us. When the tents were hastily pitched, all of us snuggled into our sleeping bags in a jiffy. By late evening we began to worry. It had already been six hours and the snowfall continued with the same fury. Once in a while someone would go out to relieve himself and report back the condition over the radio. That evening we used radio for inter-tent communication. The higher one goes, the greater is the fluid requirement by the body in order to handle the various chemical adjustments that are taking place inside. This eventually results in frequent urges to relieve oneself. With such hostile conditions outside it was difficult to find the energy to go out and do the needful. We were stuck in a quandary, both Rajesh and I. Sometime in the evening I had noticed Rajesh coming back from the kitchen tent with a wide-necked bottle of Horlicks. Well past midnight I saw him sitting up and fishing the same bottle out. "Why? What are you going to do?" I said with an impish smile. Despite the small talk and easy banter, I knew that all of us were deeply concerned about the snow conditions. Whatever comes, we had to scale the imposing wall of the Gupt-Khal ridge and get on to the other side. That was our easiest way out to safety. There was no way we were retracing our way back over the entire snow-field and the rock and boulders thereafter. All of that would now be covered with an added three-feet layer of snow. We could scale the Gupt-Khal ridge easily but only if the snow allowed us to! After much tossing and turning we woke up to a ghostly morning. There was a grayish tinge to the dim whiteness all around. Even at eight in the morning, it looked like the evening twilight; as if the night was about to descend. It was still snowing. A brief lull in the snowfall allowed us to get into some action. We had been discussing the possibility of following an alternate route the previous evening, one that would make the climb considerably shorter but might add few hundred meters of traverse on the other side. Vinod, enthusiastically enlisted for the recee. In few minutes he was reduced to a tiny dot speedily climbing the slope of the Gupt-Khal ridge. All of us, standing outside our tents, looked on with bated breath praying for his safety and hoping fervently that the route be opened. That portion of the ridge had a heavily corniced top with just a small opening that could provide for the route. Within half an hour the suspense was over. Vinod's voice came alive on the radio. "Ye oopar jo baraf hai kabhi bhi gir sakta hai"- he was obviously pointing at the heavily corniced top. By that time Jaisingh had proceeded on the route that had been cut halfway the previous day. Basant was with him as assistant. The entire team's focus now shifted to the action happening at their end. In another hour we were getting ready to go. The weather had still not cleared but the duo or Jaisingh and Basant were now few feet away from the top. "Hum top me pahunch gaye hain Sir" reported Jaisingh in few minutes. "Utarne ka rasta recee karo Jaisingh. Kya utarne ka rasta dikh raha hai?" I asked. If the routes could be roughly established now, we would spend fewer minutes at the top and quickly proceed for the descent. "Dekh raha hoon Sir"- said Jaisingh, not sounding very sure. Finally we got an "OK" from him in another 10 minutes. It must have taken us just about 5 minutes to get ready and start off towards the ridge. Just then, the sky began clearing up. We seemed to have passed the test that we had been put through. It was a near vertical ascent and all of us focused on holding on to the rope and putting our feet on the next step ahead of us. Ahead is probably misleading, because the next step was sometimes chest high. We later calculated the climb to be not more than 400 feet in total, which took us less than an hour. At about 1300 Hours we were on the top! There was no jubilation or victory cry. Everyone was just happy and thankful. The broad grins and happy eyes said it all. Suraj was showing a "V", Bharat was offering a handful of snow to the mountain gods, Rajesh was praying with folded hands, Vishwa was busy with his telephoto lens and Anil Bisht was lighting up incense sticks to do a puja. There was this reverent silence all around. It was a mixture of too many emotions. Anxiety about the route and weather ahead, the joy of being there at 5835 meters, the spectacular beauty all around and an utter sense of thanksgiving! As Negi and Bharat wrote later "We could do it because the Mountain allowed us to". How true! We might conquer and re-conquer the loftiest summits of the grand mountain, we might set foot on the deepest cranny in its great walls and valleys; but whenever and however we do it, we must remember, it is an act of permission by the Great Mountain. It is not an act of submission, for if it wishes, it can strike off a puny little man with the faintest brush. Time stopped still as we surveyed the vista at the top. The Gupt-Khal ridge has a North-South orientation. To the North was the route that Smythe would have followed over the pyramid of Pk6600 on his way to The Mana. To the south is the Pk 6029 behind which appears the Mandir complex (The Mandir Parvat with its two lesser subsidiaries). To our East, the Mana stood tall overlooking us. Garh camping ground was looking pretty under the shades of the clouds far away in the South East. The Alakananda valley and the myriad peaks flanking it dominated the entire view towards the West. We could recognize the Neelkanth, Chaukhamba and Arwa Tower. To the South-west and North west were the two glaciers that emanate from the Nakthani Snowfields- The Dakhani(Southern) Nakthani Glacier and The Uttari (Northern) Nakthani Glcier respectively. A route had to be now found for the descent. My suspicions were correct. Jaisingh had not yet decided on the possible route of descent. Somehow he is always more confident about descent than ascent as I had already experienced at Bali Pass. Given his mountaineering credentials, any amount of steepness in the slope appears descent-friendly to him. Thus when he pointed at the recommended descent route, we looked at each other, mouths agape with disbelief. It was a near vertical gulley between two imposing rock walls. Vinod, Basant and Jaisingh were conferring yet. Inside, we all were praying for them to explore a friendlier route down. "Koi baat nahin sir. Main aur Basant age jaa rahe hain. Route katne ke baad hum niche se signal denge" said a smiling Vinod as if he could read my mind. "Rope length kaafi hai na Vinod? "- I asked. I suspected the descent to be more than 150 meters and I knew that we had just about 150 meters of rope. "Ho jayega Sir"- said Vinod in his usual nonchalant way and soon vanished out of sight into the depths of the gully below with the rope tied to his waist and Jaisingh belaying him. He wasn't visible anymore after about 20 meters. After 15 long minutes the signal came from him over the radio. "Jaisingh! Sabko bhej ek ek karke" he was instructing. The next half an hour was an individual ordeal for each one of us as we descended down a route that was far steeper than the one we used to climb up. The last 50 meters of descent was without any rope. We had to throw the trekking poles away and use all fours to have a better grip on the holds. Finally at 1500 Hours we assembled at the bottom under a rocky overhang that seemed to be providing shelter against any possible avalanche danger. We had crossed Gupt-Khal and were now on the highest parts of the Nakthani snowfields. It's often said that one needs to be more careful in the descent than ascent. Most accidents happen on the way down or while sleeping, they say. Having finished the descent from the ridge I breathed a sigh of relief. The members had all descended and now the porters were coming down. Two of them reached where we were huddled together. As we looked on for more porters to arrive, a bundle of sleeping mats came rolling down. Now that was alarming! Someone had dropped a load! Once one porter jettisons load, somehow it becomes an epidemic with the rest. As suspected, another load followed and then another. Then a stove came crashing down. I was praying "Please, let them not drop the fuel tank!" because if they did that, we shall be without water and surely the situation shall become critical. There was no flowing water in the snowfield. We had to melt snow to get water. Thankfully the madness stopped. When we took stock after an hour, the loss was manageable. One stove had broken, one sleeping mat was lost, one porter- Chhatar Singh had a bleeding wound on the thigh and Basant was hurt on the back of his neck. We visited the porters' tent to dress up the wound and give Chhattar some painkillers. Rest of the porters seemed ok.
Jaisingh returned last with the rope untied from the anchor above. Now we had time to survey as far as our eyes could see. We were in for a surprise. The sun was peeking behind scattered clouds and lighting up the place. Two hours after reaching there we suddenly realized what a magical dreamland we were in. I had never seen anything so utterly virgin, serene and surreal where the colors of nature created such variety of illusions. Out to the West was the Alakananda Valley with the tall pinnacle of the Neelkanth distinctly visible with a crown of angry and turbulent clouds. The Chaukhamba complex was completely covered with smoky clouds. Towards the South the Mandir Parvat was visible behind Pk 6029 defining the terminal point of the Gupt-Khal ridge. Towards the Southern Nakthani Glacier were two pyramidal snow-peaks. We assumed them to be the Nar and Narayan Parvat. Towards the north was a ridge that led all the way up to the Gupt-Khal and then possibly onwards to the Mana. Our little orange colored tents contrasted beautifully against the white desert and the smoky blue sky. It must have been about five in the morning for the inside of the tents appeared relatively brighter when we heard someone crying. I first thought, it must be some illusion of the mind. But it persisted. Someone was wailing in pain and then there was some commotion that followed. Someone lighted the stove in the kitchen tent and people started moving about. We were still lazily ensconced in the sleeping bags. Rajesh is an early riser. He takes it as a personal challenge to make sure that he is through with his toilets before anyone in the camp every morning. When he came back at about six I asked him what the commotion was all about. "Some porter is complaining of pain"
"Which porter?" I suspected it must be Chhattar Singh, the one who had sustained the wound on the thigh. "No its not Chhattar Singh. It's someone else- Prem Singh I think. He is complaining of sever stomach pain." "Stomach pain? That's an unusual complaint!" " Basant was saying, he has been eating snow and not eating proper food for the last two days"
"Must be hunger pain.. What do you think?" "May be. They are giving him milk and Horlics and probably some Maggi. That's why the kitchen is up early"
"You are sure its stomach pain?" "Yeah, he seems to be clutching his stomach. Must be the stomach or the lower chest"
I was totally perplexed! The most common illness at 5650M can easily be suspected to be something related to the altitude. But, that was a distant possibility for various reasons. All of us had already spent 4 nights above 5000 meters and about 7 nights above 4500Meters. We had a high climb the previous afternoon and the current camp was marginally lower than the previous camp. There had been no report of any symptom of illness during the regular evening checks at the porters' tent! Even the current symptoms described were nowhere close to fatal sicknesses like HAPE and HACE! "In any case we were on our way down. If it were anything related to altitude, the symptoms should show betterment by evening" – I thought. "Lets ask everyone to get ready and leave Camp ASAP," I said out aloud and we began preparations for lifting camp. It was a bright morning outside and Premsingh Shahi, the porter who had taken ill was resting on a sleeping mat outside, soaking in the sun and gently groaning with pain. We had to get him down quick! At least two men were to help him get down. Luckily for us, two of the younger porters were his blood relatives- one was his nephew and the other his brother-in-law. With three porters thus incapacitated, the load carrying strength of the porter team was reduced by 25% in one stroke. Thankfully the load was considerably less since we were nearing the end of the trek. With some loads shared by some of us, the load carrying worries were handled. All that we were bothered about now was to get back safe down to Badrinath. There were too many things to bother about that morning. The eagerness to get down, the anxiety about team health, the worry of dwindling ration and the ever moody weather- this was indeed a nasty sting in the tail that the Mountain was leaving us with. Soon we were on the boulder filled right bank of the Northern Nakthani Glacier. The dreadful descent down the Nakthani snowfall, the frequent sinking down till the thighs and the blinding snow is all still a blur. Our only focus was to descend as far and as fast as possible out of the snowline. Slowly we descended down the icefall till where the Nakthani Glacier appeared weaving its way down. We were on the right bank of it, which was filled with large snow covered boulders. Jaisingh, Basant and Vinod took turns in finding a route through all that which appeared to be totally intractable. I personally sustained many falls. Luckily none of them left any injury. Waiting for the tents to arrive, I looked up over to the ridge from where the team of porters were descending slowly. That's when I noticed that something was seriously wrong.
" Vinod- Premsingh aur uske saath jo do log the wo kahan hain?" "Basant bhi uske saath tha. Phir route katne age chala gaya tha. Abhi ek kilometer picche hi to maine dekha tha"
"kaisa tha tabiyat? Kuchh better hua tha?" "Nahin sir, kharab hi tha. Haath Paon dhile pad gaye the uske to. Kandhe pe lana pad raha tha"
I was flummoxed! We had already descended 800 Meters. There should have been some improvement of symptoms! Vinod looked hard up at the silhouettes coming down from the ridge above. "Lag raha hai last me aa rahe hain"
"Premsingh aa raha hai na unke saath?" "Wo to nahin dikh raha hai Sir"
That got all of us alarmed. The guys were rounded up in no time. Soon we learnt that they had left Premsingh few hundred meters behind under a rock shelter with a sleeping bag. Apparently he had showed complete inability to move forward and had asked them to come fetch him the next morning from there. Immediately a rescue team was dispatched in the form of five strong members, Vinod and Basant amongst them with radio and torches. In about half an hour we got message from the team. Our worst fears had come true. Premsingh had succumbed to his illness under that rock shelter. The rescue team carried the body back. It was a sad and unfortunate evening at the camp. I wasn't sure how to react. It was a mixture of sadness, frustration, anxiety and anger. There was no sign of altitude sickness, nor there was any accident that the mountain caused. We weathered the worst of the weathers and now were on our way to our homes. The end of the trek was barely few hours away and yet we lost a man! How I wished I had a sat-phone at that moment. There was a moment of anger about the system. In our country terrorists get any amount of sophisticated communication equipment and the powers–that-be can have a chopper at the drop of a hat. But the average citizen, who wants to explore the high mountain, can be thrown behind the bars for possessing critical communication equipment like a sat-phone. Military forces across the world can access 1-meter resolution photographs of our critical installations. But at the borders patrolled by our own forces we cannot capture the bounty of nature in camera. Local governments tom-tom the fact about promoting adventure tourism but cannot provide accessible rescue infrastructure like Heli-rescue. Even a country like Nepal, infinitely smaller in economic might, does a job several times better than that to promote eco-tourism. Premsingh succumbed to a punctured appendix as the post mortem revealed later. I agree, it's a difficult thing to predict when such an illness is going to hit. It's also difficult to think of screening tests that can identify all possible illnesses a man can develop. If one wishes to explore the heights, out of pleasure or economic reasons, these are the incumbent risks. The issue is, can the system then provide for a way to mitigate these? If they can triangulate a sat-phone, they can very well identify one- one, which is carried by a terrorist, and one, which is carried by a trekker! A long discussion ensued in the kitchen tent about the procedures that needed to be completed at Badrinath so that a proper funeral can be accorded to the deceased and the formalities completed for claiming insurance for the family. It was pure luck that we had started the practice this time of insuring all the porters for doing the trek. I still remember the dreary discussion in the dim light of the stove in the kitchen tent. We did not have dinner, because there was nothing to eat. Whatever little was there had to be saved for the morning breakfast because it was a long distance to Badrinath that we had to cover the next day- 22 Kilometers!. Everyone was anxious to leave and reach human habitation. The mountains had struck a decisive blow to the team morale. Jaisingh and Basant left with the first light in the morning. They had to cut route and arrange for resources just in case we got stuck in the mountains again. We followed soon after at about 0830 Hrs. Vinod would follow sometime later after lifting camp. We had decided that we would try taking the body down. But if the route did not help, we would stow it in a safe place to retrieve in the next few days with additional resources arranged from Badrinath. We navigated the entire way from Nakthani snout till Badrinath that day through unforgiving and unmarked terrain, through changing moods of weather and unsure trails that threatened to disappear every now and then. It was an easy trail after the Nakthani confluence till the roadhead at Musapani. After 8 long hours and 18 Kms of continuous walk we finally reached Mana Village at 1700 in the evening. After a hot bath at Taptakund and the offering of a thanksgiving puja to Lord Badrinath, we met up with the team late in the night. News had been pouring in about the latest victims of the Himalayan weather. We were not the only ones who were hurt. There had been lives lost at Mount Trishul in the same period- the same night when we were weathering the 24 Hour snowfall. There was heli-rescue going on at Mayali pass. We seemed to have suffered the least on account of the mountain and the weather. The better part of the next day was spent in reporting at SDM office, Police station and arranging for resources to complete the medico-legal and funeral formalities. The sweet taste of success was tinged with the pain of the unfortunate betrayal of luck, just when we were ending it all. This was an experience unlike any other that I have experienced so far in the Himalayas. Nowhere have I experienced such changes in fortunes, such challenges and such occasions to learn. During the entire journey back the sweet memories of the sublime beauty took a back-seat. Our minds were trying to resolve the ruthless parting gift of the mountains. The fact that it was an unfortunate illness of appendicitis, that could have been handled in a hospital with least troubles was no solace. We did our bit in terms of ensuring the compensation through insurance formalities and personal contributions. But obviously that is no price for a life lost. Perhaps one shall be more vigilant about medical history of porters and not be content with a medical certificate next time on. Ensuring equipment, medicines and insurance is just not enough when the mountain chooses to unleash its wrath. That just leaves me behind with one thought. If such ordeals can be heaped in a period of two weeks after diligent preparation, comprehensive information and modern gadgetry, what would it have been like almost a century a back when the Shiptons, Longstaffs and Smythes prowled in these very mountains? Its one thing to get enamoured with reading the experiences and quite another to sample even a fraction of that experience. Perhaps one of the reasons which prompted Smythe to write thus in his work - "Kamet Conquered"
"......The successful carrying out of an expedition to the summit of a Great Himalayan Peak depends upon so many factors that it is difficult to enumerate them in order, yet however well planned an expedition may be , and however well the plans are executed, there is always one link of strength unknown in the chain of circumstances, and that is- luck. That solitary link may be stretched unreasonably and not break; it may be strong and unyielding or pitifully weak; when apparently strong, it may develop an unexpected flaw, when apparently weak, it may continue to hold. Luck is blessed and cursed, but without it mountaineering would be a dull, mechanical pastime. Luck depends largely on the weather, and what the weather has done, or may do, to the mountain. Bow therefore to luck, accept it and forget it, making sure at the same time that all other links in the chain are as strong as human ingenuity and forethought can devise. .."
Making an adventure trip is not an easy task. I remember when one of my office trip went to such an adventurous tour. There were many obstacles in their way but the captain of the team handled them comfortably and continually motivated his team mates. It's just because of him that trip was a successful trip. What I think, your captain should be much capable to handle any situation during such kind of trips. Sir, your way expressing your journey is amazing. I can actually feel how you might have experienced this trek. And your selection of treks is the thing that I liked the most. Prior to this I read your Gidara Bugyal post last week, and today I went through this travel story of yours with complete dedication during my office hours. I will try to be one of your team members in any forthcoming exploration. And I also need some info regarding the Gidara Bugyal Trek. May Prem Singh's soul RIP. I was spellbound to read the trek story!! The supporting photographs and the amazing write-up compelled me to read it word by word.. I felt as if I was a part of your team!! May the soul of Prem Singh rest in peace..